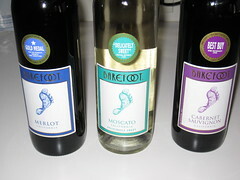 While on a run to the local drug store, noticed Barefoot wines were on sale ($4.99 a bottle). Decided to go with three wines we have rated as "Good" in the past. Good meaning we would purchase the wine again! So, in keeping with our rating system, bought a Merlot, a Moscato, and a Cabernet Sauvignon. Second house wine that we tried last night from Olive Garden. 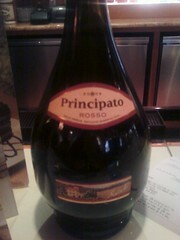 This one is their red wine - Principato Rosso. Red Wine Wino fell for this one easily; ordered a second glass to "make sure" it was not a fluke. White Wine Wino gave a thumbs up as well. Only issue is the same one as the Moscato - cannot buy anywhere else but at the Restaurant! Winos give it a "Good Rating"! Went to Olive Garden last night for a bite. Tried two of their house wines and really liked them. 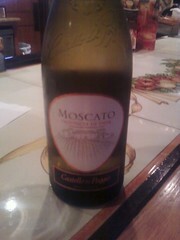 First up was the Castello Del Poggio Moscato. A sweet white wine that hooked the White Wine Wino; Red Wine Wino followed in kind. This one easily earned a "Good Rating". Only one issue, cannot get it anywhere else but at the Restaurant! 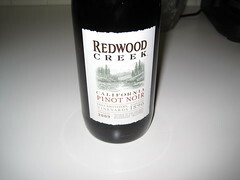 Redwood Creek's offering in a Pinot Noir. Established in 1890 by Frei Brothers' Vineyards of California, the bottle we tried was vintage 2009. Red Wine Wino thought it tasted great and would buy more. White Wine Wino argued the opposite, blaming the Red Wine Wino's taste buds have been tainted with too much alcohol. Going with our rating system, this Pinot Noir gets a neutral rating since neither Wino could agree to buy/not but another bottle again.